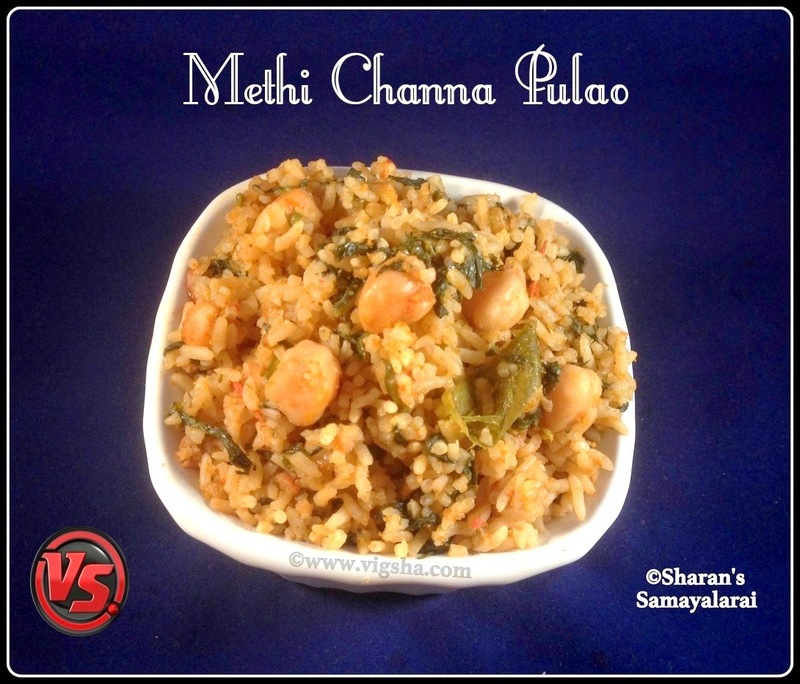 Methi Channa Pulao is a healthy and delicious one-pot meal, which you can relish with a simple raita. 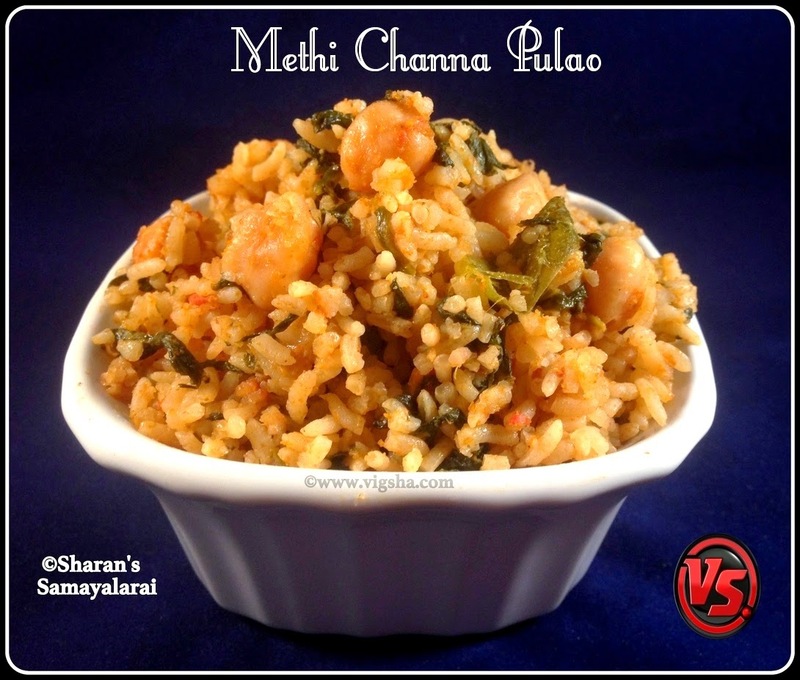 This flavorful pulao is a great way to combine the nutritious Methi and Channa together. The flavors complement each other and make this pulao a wholesome meal. It is also a perfect lunch-box recipe. 1). Wash and soak channa overnight and pressure cook it with little salt for 2 whistles till soft. Keep aside. Wash and roughly chop(check notes) methi leaves, keep aside. Make a smooth paste with coriander leaves, red chilli powder, onion and grated coconut. 2). Heat ghee/butter in a pan, add bay leaf, cloves, cinnamon and saute till aromatic. Then add onions along with salt and green chillies, saute till they turn translucent. Add tomatoes and saute till they become soft. 3). Add chopped methi leaves and saute for 2 minutes. Then add cooked channa and mix. 4). Add the grounded masala with ½ cup of water and mix. Let it cook until the masala is fully cooked and oil separates. 5). If you are planning to cook in rice cooker, switch off the pan and transfer the contents to the rice cooker. Then add rice and water to the masala, switch on the cook mode. If using pressure cooker, add water and rice to the cooked masala and close the lid. Cook for a whistle or two and switch off. Once done, fluff the rice carefully with a fork. This helps to stir the without breaking the grains. Serve this aromatic pulao with simple raita. # Keep the methi leaves immersed in salt & water till use. This helps to reduce the bitterness slightly and keep it fresh. # Chopping the leaves will make the pulao bitter. So its optional to use it as such or chop it.